I previously wrote about Win32 binaries using a PE header subsystem version to indicate support for a new version of Windows. But what happens when a binary needs to run on an old version but the new version is sufficiently different to require indicating compatibility? 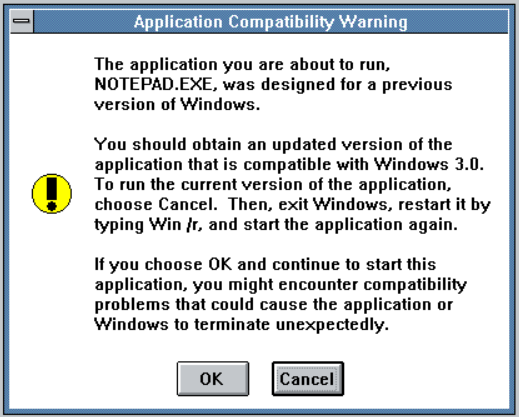 In order to allow an application to run on both real mode Windows 2.0 and protected mode Windows 3.0 without the warning, two bits were used in the executable format to indicate support for protected mode memory and proportional fonts. The tool to set these bits was distributed with the Windows 3.0 SDK - not exactly convenient, because any application requiring this treatment must have been compiled with the Windows 2.x SDK. Copyright (C) Microsoft Corp 1990. All rights reserved. -q   indicates to MARK.EXE to suppress the listing of major operations. so that it can run safely in protect mode. instead of the fixed-pitch font used in Windows 2.x. Application cannot be marked FONT without also being marked MEMORY. Having marked an application in this way, Windows no longer displays a warning. It's possible to set these bits on any binary - they're in offset 37h from the NE header - but note that if the application really isn't designed for protected memory, it's likely to crash. Since Windows 2.0 wasn't a very popular platform for developers, there aren't many applications that were marked in this way. One prominent exception is Word for Windows 1.1, which runs on Windows 2.x and 3.x protected mode correctly.